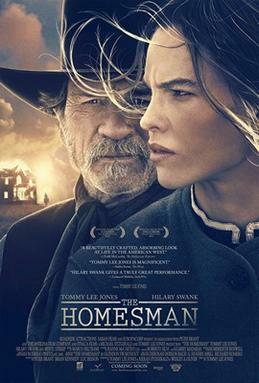 Tommy Lee Jones both directs and stars in this western that follows a hardened woman (Hilary Swank) who is tasked with taking three crazy woman to a church in Iowa that helps mentally ill women. Hilary Swank is particularly strong as a hard-willed woman living as a woman in a man’s world, and she portrays both her steely exterior and her internal loneliness and longing for a husband exceptionally well. Tommy Lee Jones is also in fine form as a ‘claim jumper’ who Cuddy (Swank) finds left to hang by some of the men in her community, and he is rescued on the basis that he helps her transport the woman across the country. The basis of their relationship is what fuels the film, and Swank and Jones build good chemistry with each other that leads to some really strong moments for their characters. At times, the film is quiet and contemplative and this works strongly for the narrative as we’re given space to appreciate the luscious cinematography of the sparse midwest, and the understated score. We’re not told a great deal about Briggs (Jones), but like many journeys depicted in film it starts off fueled by money and ends up growing into something deeper, and the transition is depicted extremely well in this. Jones has filled his supporting cast with reliably strong actors such as John Lithgow, James Spader and Meryl Streep, who lend gravitas to even the smallest roles. Overall, ‘The Homesman‘ is a strong western with a female outlook that features excellent lead showings from Swank and Jones. I really enjoyed it.